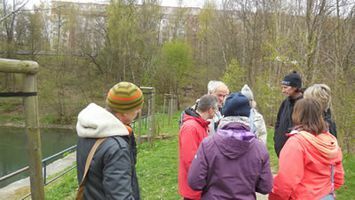 On 25 October 2018, the Saxon Sächsischen Landesstiftung Natur und Umwelt and the Leibniz Institute of Ecological Urban and Regional Development (IOER) in Dresden have held a joint conference on "Natur in der Stadt – Bedeutung und Aufwertung von Stadtgrün für urbane Ökosystemdienstleistungen"(Nature in the City - Importance and Enhancement of Urban Greenery for Urban Ecosystem Services) at the IOER in Dresden. The BIDELIN team presented the first interim results of the project to about 80 participants from all over Germany and from all over the world. 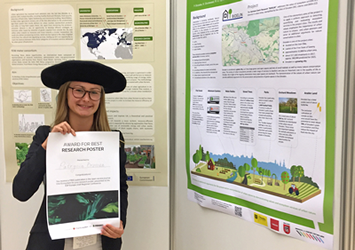 At the ESP Europe Regional Conference 2018 in San Sebastián, Spain, Patrycia Brzoska of the IÖR convinced with a poster about ecosystem services in the city. The poster by Patrycia Brzoska presents interim results from the German-Czech project "BIDELIN - The Values of Ecosystem Services, Biodiversity and Green-Blue Infrastructure in Cities: Dresden, Liberec and Děčín". Poster "Urban Nature in Dresden - Services and values of urban ecosystems"
The 6th course about values of ecosystem services, biodiversity and green-blue infrastructure in cities focuses this time on exemplary parts of the city Děčín - Marianska louka, Kvadrberk -. The course took place in the second week of October at Jan Evangelista Purkyne University in Usti nad Labem (UJEP). This three-day course enables Czech and German students to test methods for mapping a green-blue infrastructure. The aim of this mapping is to evaluate the ecosystem services of selected sites. Ecosystem services are the direct and indirect contributions of ecosystems to human well-being. Each Czech-German student group have worked on a joint project till January 2019 months. They used the acquired methods to evaluate green-blue areas in Děčín. 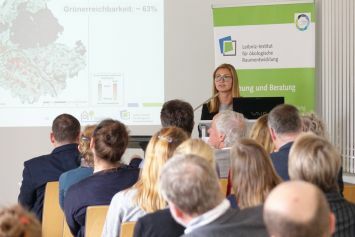 The interim results were be presented in November 2018 at the Dresden conference of the Leibniz Institute for Ecological Urban and Regional Development in Dresden (IOER). At the end of January 2019 they presented their results at a final workshop at the IOER. 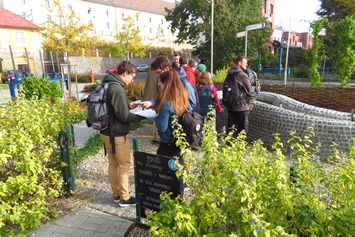 As part of the BIDELIN project, the first German-Czech student course "Green and Blue for the City - Capturing, Evaluating and Optimising Urban Ecosystem Services" was launched at the end of September 2017. 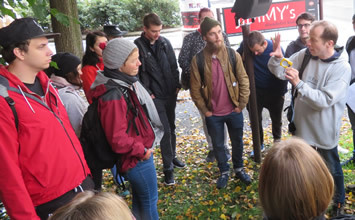 During the following winter semester, students from both countries (Jan Evangelista Purkyně University in Ústí nad Labem, Anhalt University of Applied Science in Bernburg) have collected data of urban green spaces in Liberec and have evaluated their value regarding ecosystem services (ESS). On the one hand, this work will contribute to the ongoing establishment of a catalogue of green spaces in Liberec, including the development of a tree cadastre. That will be a basis for developing targeted maintenance for urban green spaces in Liberec. On the other hand, this work provides useful information for assessing the value of green spaces (ESS) in Liberec within the BIDELIN project. ­Analysis and evaluation of ecosystem services provided by blue-green infrastructure in Dresden, Liberec and Děčín taking account of shared features as well as country-specific features.. Results are processed for relevant groups, in particular planning agencies and decision-making bodies (local authorities, investors). Findings are communicated to foster environmental education, primarily in the form of publications, nature trails and workshops. Practical examples to improve blue-green infrastructure and ecosystem services.